Yesterday the price of the pair GBP/USD slightly declined; however unlike European currency sales volume of the Pound has been significantly lower. 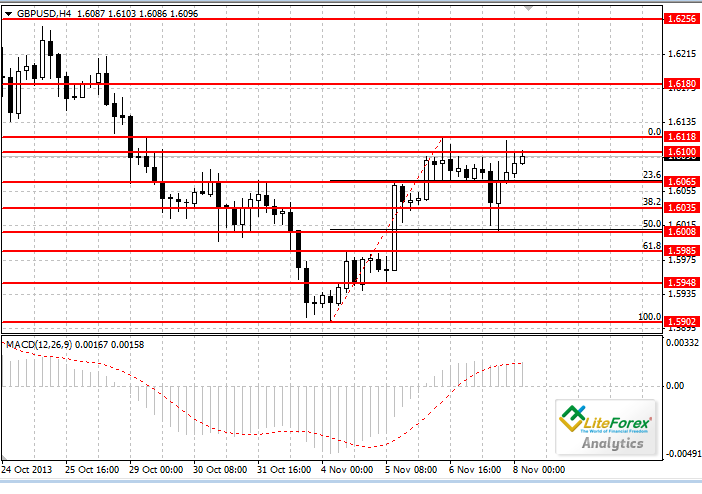 The pair has tested the level of 50% (1.6008) Fibonacci retracement and after that the “bulls” regained the losses and the price returned to resistance level of 1.6118. Today important macro-economic index of Non-Farm Payroll in the USA will become known. The index will significantly affect the GBP/USD rate. Another important event is the speech of the US Fed chairman Ben Bernanke, who may clarify future of the quantitative easing program. On the other hand, the Pound can be supported by favourable data on trade balance of the UK. Experts expect reduction of deficit. The nearest resistance level is psychologically important level of 1.6100. Breakdown of this level will open the way to 1.6180 and 1.6256. Support levels are on the Fibonacci lines of 23.6%, 38.2%, 50% and 61.8%. MACD histogram on the four-hour chart is in the positive zone. Its volumes are gradually increasing, crossing the signal line and giving a signal for opening long positions. Resistance levels: 1.6100, 1.6118, 1.6180 and 1.6256. Support levels: 1.6065, 1.6035, 1.6008, 1.5948 and 15902. Given eventful economic calendar, pair’s dynamics will depend on the macro-economic statistics. Buy orders can be placed only if the price consolidates above the level of 1.6118 with stop-loss orders at 1.6100. If the US news will be positive it is recommended to open short positions below the level of 1.6065.